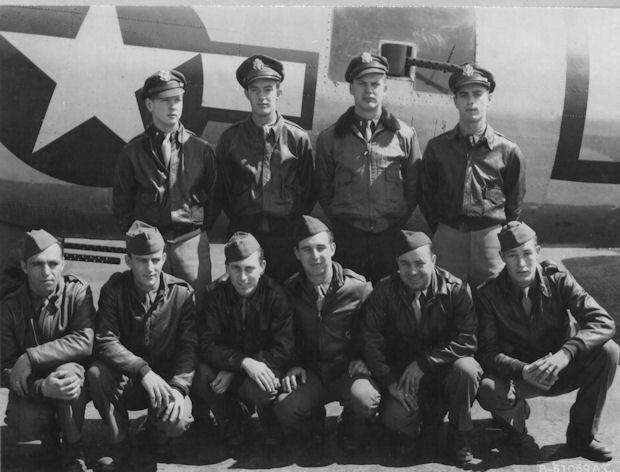 1Lt Gareth G. Lee (P) - First three missions (184, 185, 186) flown as CoPilot with combat Orientation Pilot, 2Lt Campbell Miller and other members of his crew. Completed combat tour (34 missions) on 19 Sept 1944 (Mission 244). 2Lt William E. Bowman (CP) - Flew on all of the 1Lt Lee missions except for 184, 185, 186. Flew on three missions with other Pilots (204, 243, 247). Completed combat tour (34 missions) on 27 Sept 1944 (Mission 247). Promoted from F/O to 2Lt on 6 Sept 1944. 1Lt Morris Sweig (N) - Flew on all of the 1Lt Lee missions except for the last three (236, 237, 244 where substitute Navigators were used). Flew on three missions with other Pilots (181, 183, 224). Mission 224 flown as a PFF Lead Crew Navigator. Completed combat tour (34 missions) on 9 Sept 1944 (Mission 235). 2Lt Charles D. Townsend (B) - Flew on all but six of the 1Lt Lee missions (197, 225, 228, 231, 233, 244 where substitute Bombardiers were used). Flew on four missions with 1Lt Donald D. Stark (P) (227, 232, 225, 231). Wounded by flak on mission 231, 14 August 1944 to Mersburg, Germany and was hospitalized. Flew on 32 credited mission. Last mission on 8 Sept 1944 (Mission 237). Enlisted Crewmen - T/Sgt Victor D. Townsend (E), T/Sgt James E. Adkinson (R), S/Sgt Joseph D. Grundon (BT), S/Sgt Martin Olive (WG), S/Sgt Gerald D. Newman (TG). Flew on all of the 34 credited 1Lt Lee missions. Completed combat tours on 19 Sept 1944 (Mission 244). Sgt Anthony Medici (WG). Removed from crew before the 1Lt Lee Crew's first mission. The second Waist Gunner position was deleted from 358th BS combat crews. Flew no 303rd BG(H) combat missions. Transferred out of 358th BS on 18 July 1944. A substitute Waist Gunner was used on mission 184 (19 June 1944) - the only 1Lt Lee mission where two Waist Gunners were used.